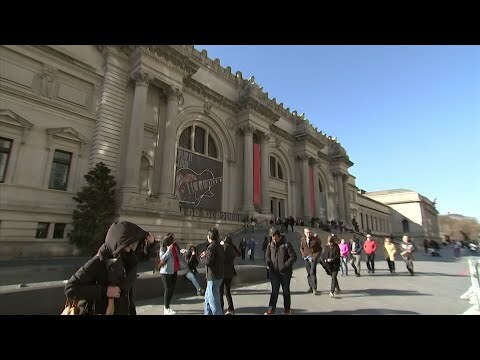 Interviewed by The Associated Press on Monday, Page, the guitarist and founder of Led Zeppelin, said that when curators approached him and explained their vision of the exhibit — you approach it through the Greco-Roman art galleries and then suddenly come upon Berry’s guitar — he was all in. Over 130 instruments are featured in the show, including ones played and beloved by the Beatles, Elvis Presley, Bruce Springsteen, The Rolling Stones, The Grateful Dead, Lady Gaga, Joan Jett, Metallica, Steve Miller, Page and other rock ‘n’ roll greats. The collection spans 1939 to 2017. All the instruments are on loan, most by the musicians themselves, although Miller has promised to donate to the Met his 1961 Les Paul TV Special guitar, painted by surfboard artist Bob Cantrell. Featured is a fragment of a Hendrix guitar that he set on fire and smashed onstage at the Monterey Pop Festival in 1967; a Gibson SG Special guitar destroyed by Townsend during a photo shoot with Annie Leibovitz for Rolling Stone (and preserved in Lucite); and a modified Hammond L-100 organ used by Keith Emerson as a “stunt instrument,” which he would jump on, pull on top of himself, stick knives in and — in this instrument’s case — set ablaze during performances. “Play It Loud: Instruments of Rock and Roll” is accompanied by a hefty and detailed catalog of the same name (The Metropolitan Museum of Art, distributed by Yale University Press, 2019).